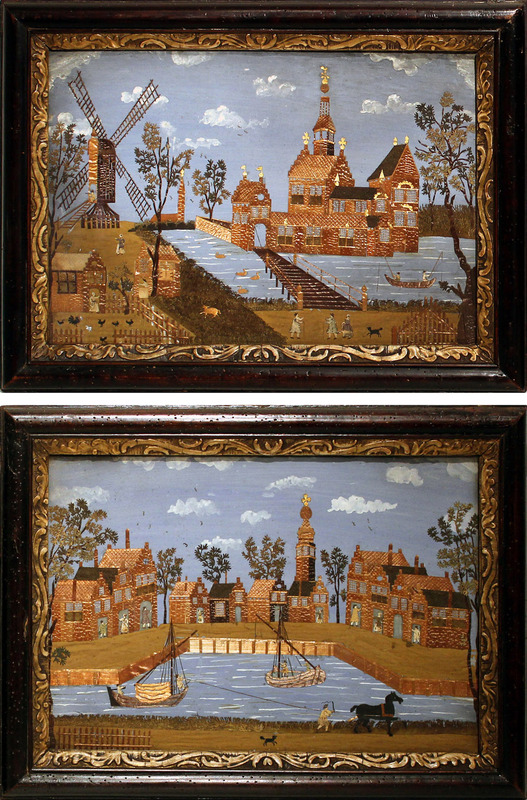 Outstanding pair of detailed and whimsical pictures of gouache and straw work, depicting Provincial life along a river, with many people, birds, waterfowl and animals, with boats, public buildings, townhouses and a windmill, Dutch, 18th century, original Fine carved frames with old worm holes. Provenance: Desmond Coke (1879-1931); a novelist and writer of stories for boys, who wrote under his own name, as well as the pseudonym Belinda Blinders. Excellent condition, Very minor loss to some of the work (a post in the fence in the lower left corner of one), and some minor worm holes in the frames.